With the 1987 Bow season just one week away, I was already getting sighted in for the upcoming season. I did most of my scouting while harvesting corn on the farm. I was seeing many bucks feeding in the alfalfa fields, but I had yet to see anything impressive. I'd been working hard at getting in the corn and decided to take a break and make my way through a hedgerow to look down the slope of an alfalfa field. As I approached the edge of the slope and peered over, I spotted two nice 8-pointers and a 10-pointer less than 40 yards away. I have lived here all my life and never saw a buck that big. Right there I made plans to put my tag on this buck! Bow Season opened and I hunted hard, but never got a look at the big buck. With only three days left in the bow season, I settled for a 7-pointer. Gun season was just two days away and everyone was preparing for opening day. At the time, we had sixteen hunter hunting the land on the farm. After a few weeks, ten of the sixteen already had their buck. I hunted hard and still hadn't seen that big buck. Everyday I asked the other hunters if they saw the buck, but nobody had. With the season coming to a close I was starting to get worried. There was only three days left and my Father in Law, Joe, asked me to go hunting. I couldn't go so I told him he could use my stand in the swamp. 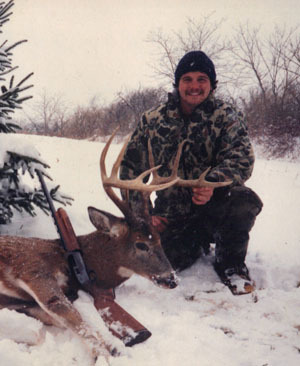 Joe sat in the stand until 10:30 am that morning then started his way out of the woods. He came to the edge of the alfalfa field when he noticed a doe running across the field and right behind her was that big buck! Joe knew there was no way he was going to get this buck on his own, so he walked back to the car and drove to my house to get me. He said he saw the big buck and told me what direction the two deer went. I told him I had a pretty good idea where they might be going to lay down. I asked Joe if he wanted to be the driver or shooter. Joe demanded that I be the shooter because he was afraid he might miss. The two of us headed back to the woods where I explained to Joe how to go around as to not be seen by the deer. I posted myself where I thought the deer would try to escape into the field. I wasn't there ten minutes when I heard branches breaking and the doe came running, full speed, into the field. Sure enough the big buck was following just 30 yards behind her. They were 60 to 70 yards away when I raised my Remington 1100 and took aim. I remember telling myself not to miss. I fired once, but the buck kept running. I fired a second shot and the buck went down, sliding about 20 yards in the snow. As I walked toward him he jumped to his feet and started running again. I pulled up and fired a third shot, down he went. I wasn't taking any more chances and ran as fast as I could to the buck, fired a final shot, and it was over. There lay the beautiful 10-pointer I saw nearly two months earlier. Joe showed up and was so happy that he picked the buck right off the ground. A special thanks to him for wanting to hunt that day! John's Oneida County 10-point dressed at 175 lbs. and scored 142-4 B&C qualifying it for entry in the NYS Big Buck Club.